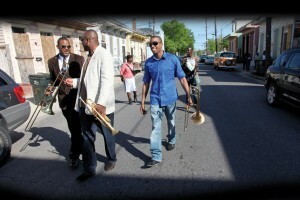 From L-R: Glen David, James, and Troy "Trombone Shorty" Andrews. Photo by Elsa Hahne. Check out a slideshow of the full photoshoot accompanying this story here. Jessie Hill’s “Ooh Poo Pah Doo” is one of the great New Orleans singles, and its Mardi Gras Indian chant, one of the great song-starters. James Andrews recapitulates its call-and-response miracle every time he hits the stage, and crowds all over the world always respond. 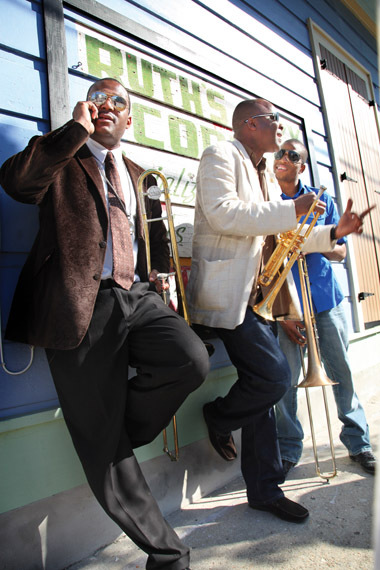 Brothers James and Troy “Trombone Shorty” Andrews and their cousin Glen David Andrews have been among the most active New Orleans musicians over the last five years as the city has struggled to re-establish the foundations of its culture. They and a slew of cousins in their extended family populate some of the city’s most important bands. Each of these three musicians has issued a signature album since the flood of ’05, records that reflect their peculiar sensibilities. They grew up together in the Treme, but they grew up to be very different people. Their experiences in the neighborhood have done much to shape their personalities and their place in New Orleans’ musical world. James, the oldest by more than a decade, is deeply entrenched in the funk and R&B of the city’s history. His post-Katrina album, People Get Ready Now, features his band the Crescent City Allstars, a literal musical community that includes an eclectic array of his friends including Big Chief Alfred Doucette and Walter “Wolfman” Washington. Troy “Trombone Shorty” Andrews, James’ younger brother by 16 years, could easily be mistaken for his son. Where James is loquacious, Shorty is reticent. His just-released album, Backatown, is an impressive series of tight, well-crafted songs that draw as much from hip-hop and rock as the funk and second line music he grew up with. Cousin Glen David Andrews is nearly six years older than Shorty but still a decade younger than James. He is the most mercurial of the three musicians, a great, enthusiastic storyteller and extremely emotional conversationalist who can take you on a rollercoaster of expression even during a brief exchange. His gospel album, Walking Through Heaven’s Gate, recorded live at the Zion Hill Baptist Church where he grew up attending services with his family, demonstrated his testifying side. 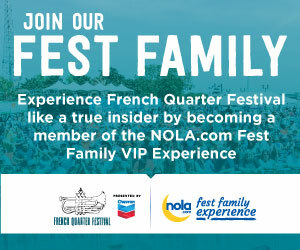 His ferocious exuberance made his Gospel Tent set at last year’s Jazz Fest one of the highlights of the event. Another cousin, Revert “Peanut” Andrews, also plays trombone in Glen David’s band, as well as in Rebirth with another cousin, trumpeter Glen Andrews. More cousins play with the Dirty Dozen and Hot 8 brass bands, while a whole new generation of nephews perform as the Baby Boyz Brass Band. It’s not difficult to be steered into a life of music when you’re literally surrounded by it from childhood. The house where James and Troy grew up, by the intersection of Dumaine and North Robertson in Treme, was constantly filled with music. James and his brothers also met Dr. John at their grandmother Dorothy Hill’s house. Danny Barker taught the Andrews kids about traditional music. James and his brothers played in Barker’s Roots of Jazz band before forming their own group, the All Star Brass Band. They played in Jackson Square in the afternoons, then watched the masters of the craft at Preservation Hall in the evenings. James learned his traditional jazz lessons well, but there was one musician who he heard only on record that stood out above the rest: Louis Armstrong. “That’s the magic for me,” says James. “Louis Armstrong. I think every musician in New Orleans is some kind of influenced by Louis Armstrong. When I was a kid, everybody was talking about him. Papa Celestin was my grandmother’s godfather. She’ll tell you Louis Armstrong was her cousin. Tad Jones told me that too; he said, ‘You’re related to Louis Armstrong.’ Around the house, they were always playing his music. That’s where I first heard him. They would say, ‘That’s Louis Armstrong. He’s your cousin.’” Troy, however, says he hasn’t heard this story. James became the organizer of his generation of Andrews family musicians. His gregariousness made him a natural leader, and he included the array of brothers and cousins in the second line parades, Jackson Square sessions and impromptu performances by what would eventually become the Andrews Family Band. He was also a charter member of the New Birth Brass Band. Naturally, James was one of the first to recognize the musical talent of his youngest brother Troy, who began playing whatever he could get his hands on even as a toddler. Troy played his first show outside of New Orleans when he was four years old. “We took him on the road with us,” says James. “His first gig was in Arizona. He couldn’t even reach the full slide position on the trombone, but he had it in him.” James began to introduce Troy as “Trombone Shorty,” a nickname that took hold. 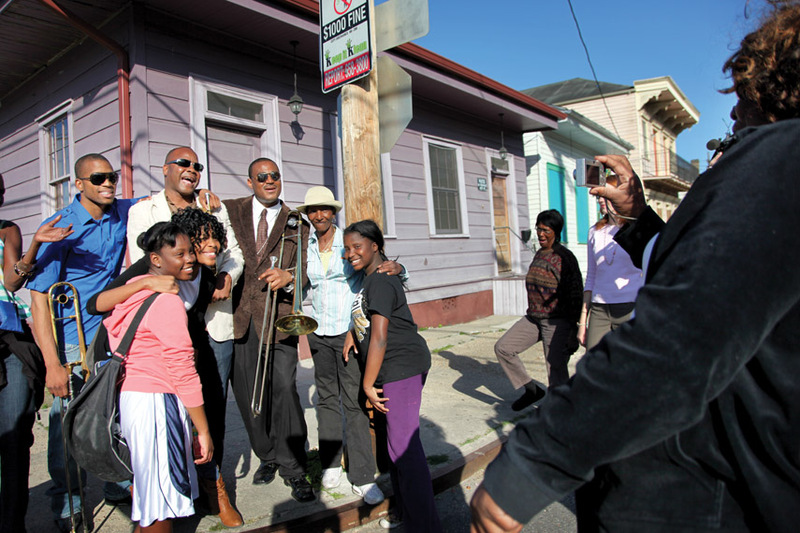 Troy, James and Glen David Andrews pose with their neighbors in Treme. Photo by Elsa Hahne. Danny Barker took particular delight in teaching the rudiments of traditional jazz to this youngest of pupils. The family decided to open a music club based on the growing fame of their precocious child, calling it Trombone Shorty’s. Troy’s primary recollection of the club is that he wasn’t allowed to play there. Shorty’s careful remarks contrasted with Glen David’s more florid observations of the same events go a long way toward defining the differences between the two. “He was playing every time the band struck up,” laughs Glen David. “It was the world famous Caledonia Ballroom and my auntie bought it and named it after Troy. There was even a drink called the Trombone Shorty. Glen David and his older brother Derrick Tabb, now the drummer in Rebirth, lived a stone’s throw away from James and Troy at Ursuline Street right across from their grandmother’s place, Ruth’s Cozy Corner, which later became Joe’s Cozy Corner. The cousins all bonded as children. Hill made an impression on Glen David. Glen David’s gift for songwriting manifested itself early. He says he wrote the anthem “Knock with Me, Rock with Me” while he was with the Trombone Shorty Brass Band, even though it wasn’t recorded until years later. The Andrews family suffered a deep tragedy when James and Troy’s brother Darnell “D-Boy” Andrews was murdered. The experience may have deepened the family’s desire to nurture Troy’s musical prowess, encouraging him to attend NOCCA to expand on his Treme roots. Glen David, James, and Troy "Trombone Shorty" Andrews. Photo by Elsa Hahne. For a family that specialized in the music of the streets and churches of Treme, training at NOCCA was a new direction. When Troy started out at NOCCA, Glen David started thinking about his own career. Troy learned valuable lessons about performing in front of large crowds from the Lenny Kravitz tour. He had always been an outstanding instrumentalist, but when he returned to New Orleans, he found a new dimension as a singer and front man and his band began to rock audiences like it never had before. Kravitz also gave Troy valuable advice about recording, a lesson he used in taking all the time needed to make Backatown the kind of conceptual breakthrough it needed to be. Meanwhile, Glen David Andrews was becoming a performing artist to be dealt with. There was no telling what lengths he might go to. At Jazz Fest, he was so caught up in the moment he started laying hands on the crowd; one night he body surfed the crowd at d.b.a.. Soon some of the top musicians in town, including cousin Troy, were showing up to jam with him. Recognition of the Andrews family as one of the greatest New Orleans musical families might have been slow in developing, but there’s no end in sight.